If you’re running a business, you have to balance the cost of a solution with its ability to cater for your industry’s specific needs. It’s a good idea to look closely at how different vendors’ accounting, payroll and human resources software meet the requirements of your industry. It’s sound management to get something that meets your needs upfront. Solutions that allow for add-on modules that include support for different industries in the core product are a good starting point. For example, a good payroll solution should cater to the needs of the bargaining council in your industry. You’ll have a far easier time doing calculations such as wages and deductions to bargaining council funds and schemes. 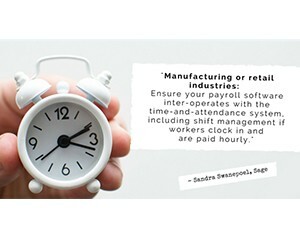 Manufacturing or retail industries should ensure payroll software inter-operates with the time-and-attendance system, including shift management if workers clock in and are paid hourly. Law firms or consulting practices need time sheets as well as expenses management and reimbursement. Utilities or municipalities need a strong billing feature that integrates with their accounting software. Manufacturers or distributors need to have strong multi-warehousing functionality to track inventory across multiple locations, then order parts and stock on a just-in-time basis. Retail companies need accounting to integrate with point-of-sale software, receivables and inventory because it’s critical to stay on top of sales and stock. Technical services such as repairs of industrial equipment should have a good job-costing tool to simplify quoting and costing. Whether you’re in retail, manufacturing, services or distribution, look out for software that accommodates unique regulations and processes, and streamlines routine ones. You want to stay focused on areas that differentiate your business, such as strategy and customer service. Businesses change as they grow. At Sage, we offer our own customer solutions, as well as add-on modules from third parties, designed for standard industry processes. So you don’t need to integrate complex add-ons to get industry-specific functionality or even develop bespoke solutions.